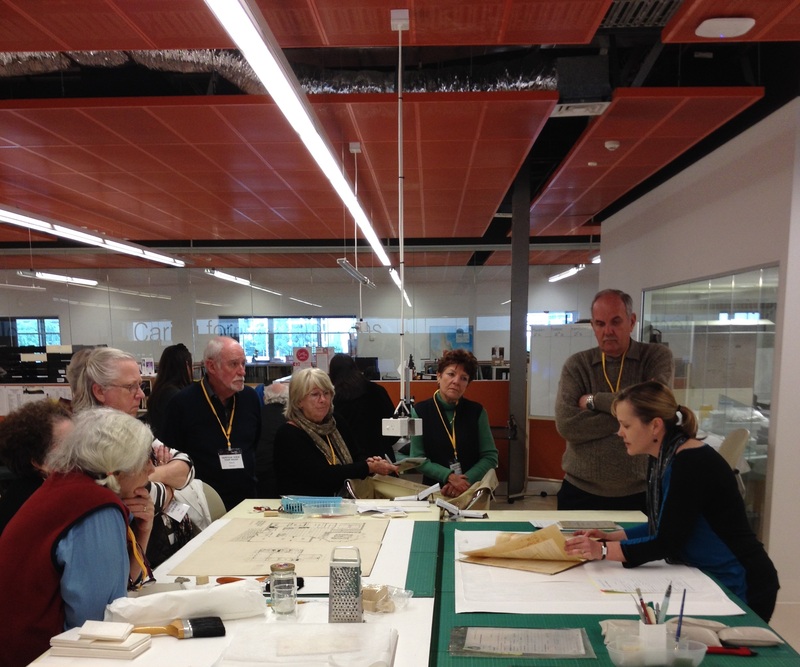 Recently, members of the Gold Coast Heritage Voice network were treated to a behind the Scenes tour of both the John Oxley Library, and the Southbank campus of the Queensland Museum. Brian Randall , Chrissi Theodosiou and the staff at SLQ were generous enough to retrieve a range of books, posters, maps, photographs, and ephemera all specifically related to the Gold Coast region from their collection stores for the group to view. Later, Reuben Hillier showed the group through the library repository where the sheer magnitude of the collection and the challenges of providing for an ever-growing collection became apparent. The careful storage and order is undoubtedly a key factor in the JOL being able to respond so quickly to collection viewing requests- largely within the hour! 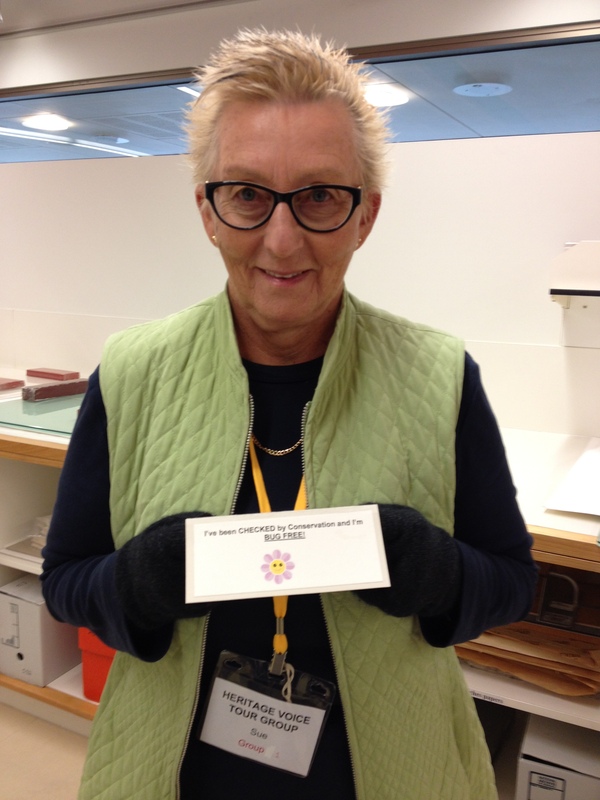 Rachel Spano greeted us at the SLQ conservation lab, where a number of specialist conservators were at work on fragile paper based objects. The lab has a range of specialist equipment at hand, including some fanciful looking gilding and embossing tools. There was an interesting conversation about the principles behind the appropriate choice of conservation or restoration in a library context, which provided some interesting perspectives compared to a museum standpoint. At the Museum, Nicholas Hadnutt treated the group to an in-depth examination of the Social History collection stores and the treasures that it holds. While some elements of the collection elicited nostalgic reactions and others confirmed a long history of collecting, all asserted the important role of Queensland Museum as responsible custodians of significant Queensland histories. Sue from the Kirra Hill Heritage Group gets the all clear from conservation! A visit to the conservation lab provided an eye-opening experience, with the opportunity to see the painstakingly precise nature and results of conservation work. Textiles Conservator Dr Michael Marendy shared some simple, yet effective techniques for preserving costumes, while Jenny Blakely and Caroline O’Rorke showcased some current ANZAC related objects being treated. The visit was facilitated by the Museum Development Office of South East Queensland, Dr Kevin Rains and Jane Austen at Gold Coast City Council, Nick Hadnutt and Jenny Blakely at Queensland Museum Southbank, and Anne Scheu at the State Library of Queensland. A big Thank you to all!